Gregory Fuller joined Moore Ingram Johnson & Steele in 2008, as a member of the Nashville litigation department. His practice focuses on Tennessee’s Workers’ Compensation law, premises and products liability and insurance defense in general. Raised in Gallatin, Tennessee, Gregory attended the University of Tennessee, graduating from the College of Business with honors and a B.S. in finance in 2004. He was then admitted to the University of Tennessee College of Law where he served on the Tennessee Law Review, published articles on the Free Exercise Clause and Chinese Federalism, and studied international law in Cambridge, England. 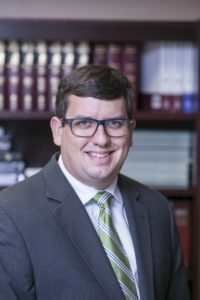 Gregory began clerking for Moore Ingram Johnson & Steele during his third year of law school and then went on to join full-time after passing the bar in 2008. He has recently spoken at the Atlanta Claims Association on workers’ compensation topics and lectured on Applying the Rules of Evidence at continuing legal education seminars. Gregory works in the Brentwood office and lives in Franklin, Tennessee with his wife, Julie and sons Jack and Sam. He takes pride in Volunteer sports, loves traveling and enjoys all that Nashville has to offer.